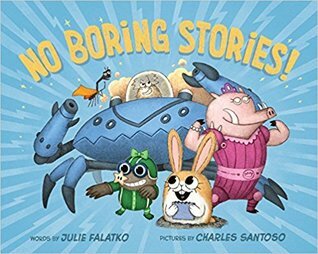 Julie Falatko is a modern day gadabout with the ability to have deep and meaningful conversations with kitchen appliances, who can parallel park with an 87% success rate, and who writes stories about misunderstood animals trying to find their place in the world. Please hold your applause until the end. Julie grew up in New Jersey, an only child surrounded by books. She decided at age 8 that she wanted to be either a writer or a librarian, and then was attacked by an evil forgetting ray (she suspects her blender), and so it wasnt until 25 years later that she remembered, went to library school, and wrote books. She has forgiven the blender. Julie is the author of five picture books. Snappsy the Alligator (Did Not Ask to Be in This Book), illustrated by Tim Miller, was published by Viking Childrens in February of 2016, and received four starred reviews (from Publisher's Weekly, Kirkus, Booklist, and BCCB). Snappsy has been featured in People Magazine, was on the Spring Indie Next list, and on the ALSC summer 2016 reading list. In June, 2016, Amazon.com named Snappsy as one of the Best Books of the Year So Far. The sequel to Snappsy (also illustrated by Tim Miller) will be published by Viking in the fall of 2017. The Society of Underrepresented Animals, illustrated by Charles Santoso, and Help Wanted: One Rooster will also be published by Viking in 2018 and 2019. The Great Indoors, illustrated by Ruth Chan, will be published by Disney-Hyperion in 2019. Julie lives in Maine with her husband, four children, and two dogs, where she maintains a Little Free Library in front of her house. Ok. Now you can applaud.